'Twas a busy evening at A Bubbling Cauldron last night. 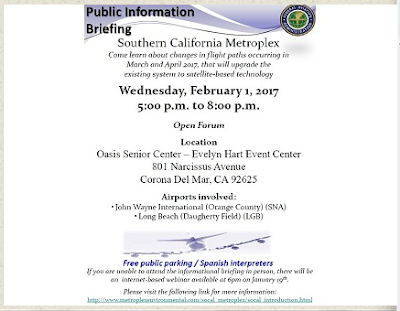 First, we attended the briefing provided to the public at Newport Beach's Oasis Senior Center in Corona del Mar regarding the changes being made by the Federal Aviation Administration in the airspace over the United States. 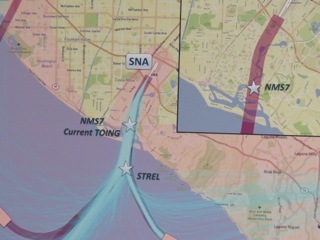 This briefing focused on the impact of the changes on John Wayne Airport and Long Beach Airport. The City of Costa Mesa announced this meeting on the City web site HERE, and provided a link, HERE, to the Southern California Metroplex (SoCal METROPLEX) Environmental Assessment Website. The country has been carved up into several "metroplexes" for the purpose of studying and evaluating the changes thought to be necessary to bring air traffic control into a more modern mode. This is a very informative site, which also has dozens of other links to Google Earth programs which can show us current and proposed traffic patterns in our area. According to the handouts provided at the meeting, this metroplex includes 99 new satellite-based procedures, including 41 departure procedures, 37 terminal arrival procedures and 21 runway approach procedures. Yikes! These are apparently necessary to reduce the complexity of the airspace in our region that encompasses 21 airports, including six major airports. In theory, this will improve the safety, efficiency, reliability and availability of air transportation in the United States. The new procedures replace old, inefficient systems that relied on ground-based navigational aids, which limited available flight paths. They compared it to replacing old paper maps with GPS systems while driving our cars. We are told that, once these new procedures are implemented, we may see aircraft flying in areas where none previously flew, due to route changes and the satellite-based procedures. And, yes, this is a done deal. After the FAA held 11 public workshops and conducted 79 additional briefings for stakeholders and others it has completed the studies and is moving forward. According to the handouts, phasing-in of the new procedures has begun and will continue through April. More information can be found at the project website, HERE. 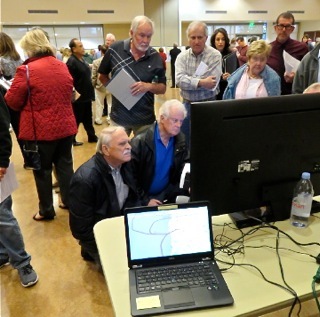 I spent a little over an hour at this casual event and joined hundreds of other interested citizens viewing the screens, trying to decipher the jargon and speaking with the experts wandering around the large room. 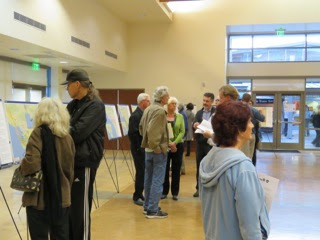 Several Costa Mesa residents were in attendance. 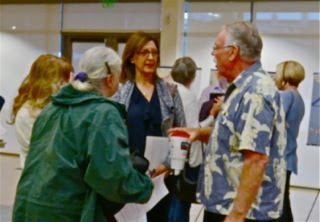 I saw Senior Staffer Minoo Ashabi chatting with former councilman and Planning Commission candidate Jay Humphrey and others. 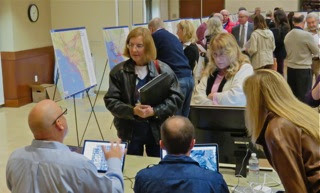 Teresa Drain, community activist and candidate for a Planning Commission seat, also attended and interrogated FAA staff. I saw Mayor Pro Tem Sandra Genis and activist Beth Refakes investigating some of the interactive screens around the room. In the handouts it encouraged us to contact our local airports if we're concerned about noise infractions. When I chatted with one of the operators of the screens located around the room she input my home address and showed me that, based on their noise monitoring conducted as part of this project, the noise level at my location would, in theory, slightly decrease. Of course, that all depends on every pilot following every rule - which doesn't happen today and I have no confidence it will happen in the future, regardless which rules are in place. COMPRESSING MORE AIRCRAFT INTO THE SAME SPACE! Based on some conversations I heard, these new procedures will make it possible to compress more flights into the same airspace. That made me more than a little nervous, especially when you consider that for these new procedures to be FULLY implemented it requires the planes flying in the space to have new, very expensive equipment. 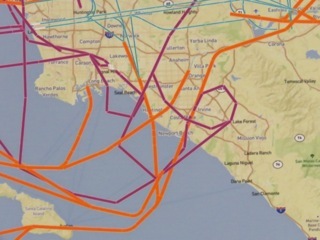 We are told that all the airlines flying into and out of John Wayne Airport are cooperating, but the airport has a very significant population of private aircraft which may NOT be equipped with the necessary new technology. So, off we go into the future. I encourage you to follow the links above and do your own visitation via Google Earth to see how these changes may affect your neighborhood. It's actually an interesting exercise. 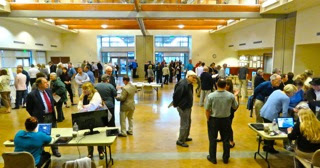 After an hour I made a rapid departure to my next meeting - the Costa Mesa Bikeway and Walkability Committee meeting at OUR Senior Center... more on that in the next entry. As I departed I noted that Orange County Supervisor Todd Spitzer had erected a shelter outside the room and was holding court with constituents. I didn't take the time to eavesdrop on his conversations. Great write-up. This change is 15 years or more in the making!